Thanks for the AMAZING workshop we had today. Words can’t begin to describe how grateful I am for today’s experience and for having met you and your team. It has renewed my energy, motivation and conviction to fight for what I have always believed in and to work towards making my community and the world a better place. You have given me courage to stand up and open my heart to feel what others feel both in my profession and personal life (something that had always been a part of my personality and which I had been repressing for some time since I started my clerkships and Medicine in general). Today has been a very important and defining moment in my career and in my life. I am so very grateful ... I am deeply inspired by all of you and would love to acquire your knowledge to share with my community and my life. Beatriz Zayas - third year med student at the University of Puerto Rico after attending a eCPR workshop. "I have never rated a training as high as I did this one because the quality of the content and the 'presenters' was the best I ever encountered." "These are skills that - once acknowledged - I realize are intuitive and in my nature, but have not been supported through my education/other trainings. eCPR has brought a new breath to my work and my perspective." “Anyone interested in improving their ability to connect and work with a person in an emotional/behavioral crisis will benefit from learning the three eCPR core practices; connecting, empowering and revitalizing. People who serve as crisis responders in the community; behavioral health workers, social workers, service coordinators, emergency medical professionals, fire service professionals, public safety and law enforcement professionals, volunteers, peer supporters, etc. will benefit from the simple, yet powerful keys to supporting a person during a time of crisis and the pathway eCPR suggests for helping the person move into recovery. eCPR’s greatest gift is its simplicity of use and the natural way that these practices are used by those who engage them.” Ed Riddell, M.S., Developmental Disability Services, Public Safety Specialist, State of Vermont and former Portland (OR) Police Bureau CIT Coordinator and Officer. "In my 26 years of recovery I have not experienced anything as profound and empowering as the eCPR training. Thank you for helping me learn new tools and allowing myself to grow and express who I am. The whole training inspired me to be a better person and to not be embarrassed by who I am." "It was one of the most profound experiences I have ever had. This is the kind of work I want to be doing to build community. It is a transformative process." "It has been a great experience and has shown me powerful the gift of listening and support is. My only wish is that more of my co-workers were here to gain the knowledge and partake in the experience." "I loved the eCPR training because it teaches us to connect with others as individuals, not a diagnosis, and not using a pre-determined method. This training, unlike other trainings I have attended, teaches us to honor the individual and their unique experience/crisis." "eCPR training allowed me to have a connection with others in a way I've never had before. It's a necessary toll in such a computerized world not to lose connection, empowerment, and revitalization with one another as humans." "Discussions, diads, triads, and final role-plays. Whew! Sure saw the three elements of eCPR in action - CONNECTING with compassion and concern to open up communication; emPOWERMENT to experience passion, purpose, and participation; and REVITALIZE one's sense of belonging in community through re-establishing equilibrium and balance, reconnecting to relationships, routines and roles in the community." 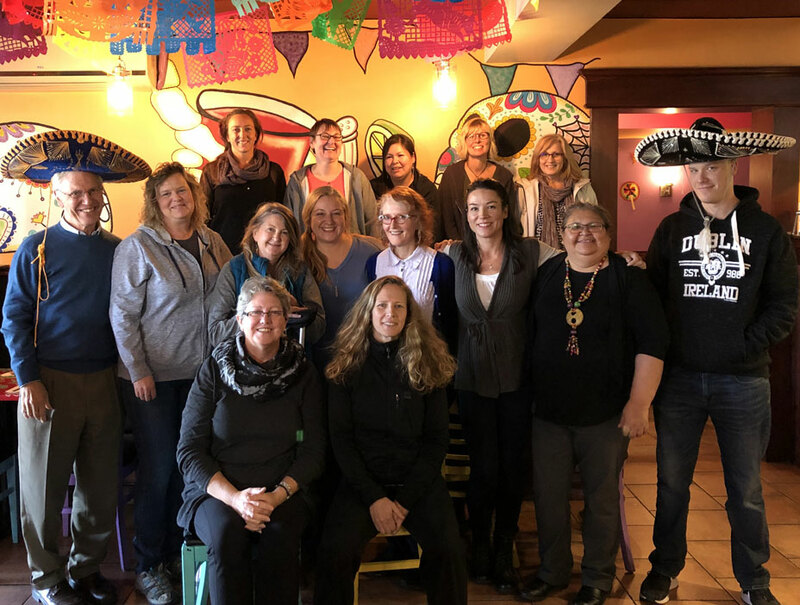 "I was struck by the powerful examples of connection and empathy provided throughout the workshop. Participants drew upon their own words instead of the tried and true labels communicating the feelings and offering support. Helping another human being rediscover their vitality - ah, how amazing. I would be remiss if I didn't mention how truly respectful you were of each person's individual expression, commentary, and true personal voice. What a joy to be with you these past three days." "As a minister and spiritual director, I found that the skills of eCPR are very similar to what I practice as a spiritual director; hopeful attitude, accessing inner wisdom, identifying' a 'vital center', inspiring motivation. I see eCPR as a form of spiritual accompaniment." "eCPR highlighted for me our diverse and unique gifts as supporters. The variety of approaches used to respond to the crises was very enlightening in learning how to best assist people through a crisis. We bring our whole self to the situation. We use our personal skills, experiences, and style. The honesty, trust, openness, sharing, and the exchange of feelings these past three days have left me deeply touched." "I found eCPR particularly valuable in realizing people's humanity, no matter how hurt they are. I learned how to use my experience to be with folks and focus on getting them back to their natural supports. It is refreshing to realize that crises are a normal part of everyone's life."